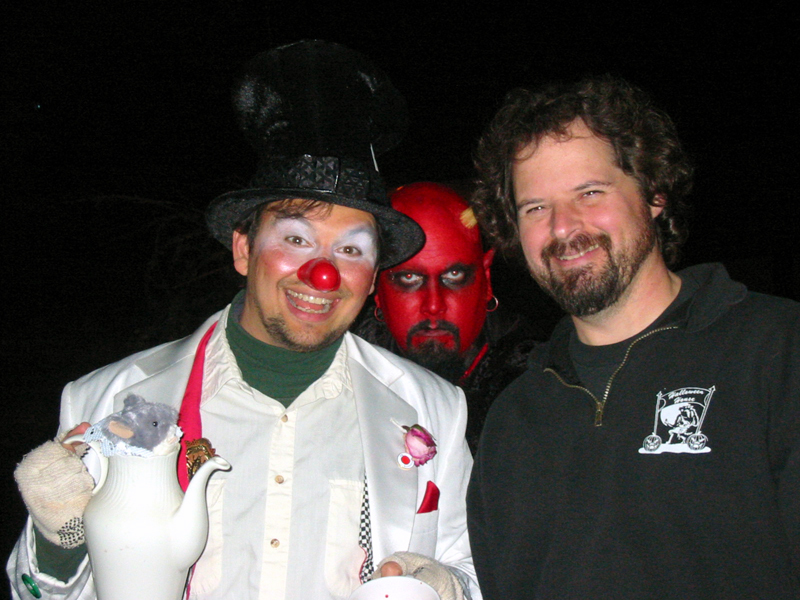 Jusby, Devilman, and Mike at the Halloween House on Thursday’s opening night/ dress rehearsal. Jusby’s make-up is a new clown-lite variation. His Mad Hatter costume is missing the giant bow tie. He’s wearing a short sleeve button up over an Evergreen sweatshirt. Not pictured: Jusby’s polypropylene long underwear and the teacup full of bloody sugar cubes. and lots more! from the Dance O’ Dance mp3 archives. I anticipate spending the majority of Halloween evening working the crowd from the front yard all the way to “the frightening Egress!” I’ll arrive at approximately 6:30 and depart at 10. Love to see you there! Posted on October 30, 2008, in Apparel, Celebrity Friends, Communities, Donations, Holidays, Music, Olympia, Performances, Tech and tagged Halloween, Haunted house, Scary Clown, tumwater. Bookmark the permalink. Leave a comment.